The workflow is simple. We use our computer to store and run programs that saves data to an external hard drive which is mirrored to a local external hard drive. The mirrored drive then gets backup and transported offsite either physically or by using an online backup service to complete the final fail-safe plan. Scenario 1: The external hard drive fails, we use the local mirrored drive as the new working drive and the replacement drive gets rebuilt as the new mirrored drive. Zero downtime. Scenario 2: The drives are stolen or destroyed in a catastrophes. We restore from the offsite service using a seed drive. Scenario 3: We delete an important file. Restore just that file from our offsite backup using their online tools. Following a 3-2-1 backup plan and building our system around it will prevent these disaster scenario from happening. Your computer’s hard drive doesn’t have to be large but it does have to be fast. A smaller 250 GB solid state drive will yield a better performance than a 4TB 5400 rpm drive. You only need space for the operating system, program files and virtual memory used by your operating system and programs such as Photoshop. In the event of a hard drive failure and you DON’T have a backup system, you only lose time by having to re-install programs. With this in mind, files that don’t have to be re-installed to work such as program preferences, plugins, actions and presets should be stored on an external drive. The computer’s hard drive is the brain, an external hard drive is the heart. The external hard drive should store any file that was created or can’t be replaced. For such an important role, we need to choose reliable hardware that will grow with us. Starting with a small 1TB drive can fill up fast and a 4TB drive sounds like a lot, but it doesn’t allow us room to grow. A network backup drive is ideal but an identical external drive will work. Remember, this is going to be the drive you will use in case your main external drive fails. We need to mirror or synchronize this drive not perform a backup. Most backup programs compress files and keep deleted files separate. That’s great for the next step but not for the local backup. SyncBack is great for mirroring and keeping both drives synchronized. Offsite backup: Compressed version of your backup stored offsite with online access. There are many choices for online backups. Compare which company has the best features you’re looking for. If the price is right and they have great customer care, use them. Alan Henry from lifehacker wrote a great article on the Five Best Online Backup Services. Depending on the amount of data you have, it may take months to back up. An alternative is seeding. Seeding is when the company sends you a hard drive and you copy your data sending it back to them. It’s faster but it may cost extra. Ideal for: Typical users, College Kids, my Dad. 1TB drives are plenty for word documents, music and cell phone photos. If using this setup with a Laptop, save $68.00 by using your internal drive as your main working drive. You have to be discipline and sync your drives plus backup to Dropbox or Google Drive. This setup isn’t Bulletproof but is better than nothing. Ideal for: Running a very small Home based business, Weekend photographers, Photographers getting started in the business. Photographers add $120.00 for the solid state drive. You’ll thank me later when editing in Photoshop or Lightroom. Adding a Network Attached Storage (NAS) such as Drobo 5N or Synology for about $499.00 to $599.00 allows your storage to grow as you grow. Ideal for: Professional photographers, Mission critical business where downtime is not an option, Users that want a storage solution to grow as they grow. I grew my 10TB system over the years.Currently I have four Seagate Desktop 3 TB HDD SATA 6 Gb/s NCQ 64MB Cache 7200 RPM in each Drobo. Each drive cost $102.00 bringing the total cost to $408.00 per unit adding $816.00 to the overall storage solution. The best part of this solution, Drobo takes the up front guess work out of determining the amount of capacity I require. I buy the capacity I need today, and when I need more storage, I simply replace my smallest drive with a larger one and immediately use that capacity in seconds. I purchased the Samsung solid state drive because of their reputation and at the time, the price was right. I use Seagate 7200 RPM hard drives for the same reason. 7200 RPM drives are recommended for faster performance. Drobo has been my choice for data storage for years. Several years ago I received a Drobo FS to evaluate. I fell in love with it and kept it. Since then, I have grown my storage needs around Drobo, upgrading from the FS to the 5D and 5N units. Drobos are self-healing, self-managing and even self-optimizing. Exactly what I need. I’ve had offers from other NAS companies to “try it, like it, keep it” over the years; a nice perk as a professional photographer and educator, but I choose to stay with Drobo. 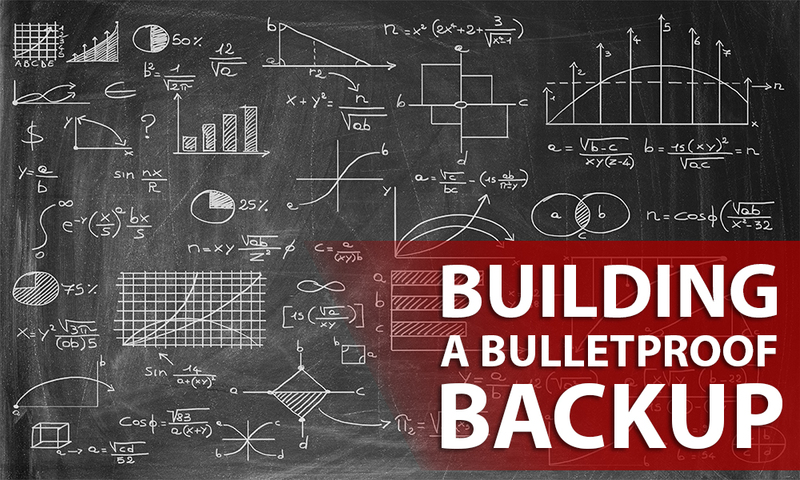 I’m interested in sharing your thoughts on your current Bulletproof Backup Plan. If you have a unique storage question or problems, feel free to leave a comment below. By the same time next year, loss data should be a thing of the past. Alan Henry’s Five Best Online Backup Services. Nice article. Here’s a variation on it though. I have a desktop computer which has plenty of space for drives, so there is an SSD for the OS, and then mirrored disks for pictures. Backup is to a Drobo 5N, I’m still working on getting the backup to the cloud and I may use the Drobo to do that. My non photo files are also stored on OneDrive, you could use Drop Box or something else too. Point is those are available to me in the cloud and I can roll back to older versions if I need it automatically. They are also backed up by the above solution. Have you come up with a defense in case you are hit by the encryption attacks that you have to pay a ransom to get unencrypted? Unfortunately some of these attack over a long time so you may be backing up encrypted files and still lose your data. Bob.. I haven’t heard of encryption attacks. I would assume a really good firewall and virus program would help. I use Kaspersky. Have you dealt with encryption attacks before? I am in the midst of major disaster recovery rebuild right now, caused by the failure of one drive in my PC Tower’s RAID array (similar architecture to Drobo but a 4 drive RAID as the main PC hard drive). What should have been a simple swap got nasty when the RAID array got corrupted and I lost the whole computer’s hard drive – almost 2 TB of programs and data. My “mea culpa” is having a stale backup of the system – but since I manually backup data I am losing only four days of work. I use a similar system to what you describe except for the cloud backup – which I may start doing soon. I have two clusters of network servers (I prefer Synology to Drobo) and manually copy all photography projects to each in duplicate. I unfortunately copy them manually about every week putting that much at risk in event of a failure. The one thing you mention I would argue with however is using an external drive as a core “working drive” UNLESS that drive is a RAID with another RAID mirror beside it and you cannot use a RAID in your computer as the main drive. First, even with faster external connection speeds, no external drive will be as quick as the one attached to your system board – even on my fast home network – and all those pauses while you are working day to day is too high a price for me to pay for that. Second, I am not sure it’s any more secure than simply using your PC’s drive. I have had MORE network RAID drives fail in the past few years than in my PC. With a RAID, you swap and go with no down time – but if you are using a SINGLE drive that is not redundant (RAID being multiple drives that back each other up), you are going to lose all your work whether it’s external or internal. If you have a RAID in your PC and a RAID external drive, the “cost” of that choice is a slower workflow with pauses at each backup. Not huge pauses, but they add up. You are likely recommending this because if your data drive fails, it’s mirrored and you go on with the mirror using your programs and operating system on your PC drive – but what if that drive fails? Where is that backed up? That is perhaps AS serious as data – getting all your Photoshop and Lightroom settings back just the way you had them – and your whole desktop environment. That’s not one of your scenarios – but is a bigger destroyer of your efficiency. I would argue that a better solution is two external RAID drives as you suggest – but do your work on a medium to large sized FAST system hard drive and use a top-notch Data Backup program such as Retospect to automatically back up in the background or at night to BOTH mirror systems. Probably not much more cost than your recommended system – but you have the advantage of your SYSTEM being mirrored twice locally and you can recover your full PC Drive in less than a day with Retrospect Restore. I would use the cloud only for data backup of important files and not necessarily programs or working directories – but that’s a money tradeoff choice. But thank you for putting this important topic out there. I have been cruising smoothly for a couple years with no drive crashes – but this current one is putting me back a week or two on a huge project and I am learning a lot about how important backup strategy is (very). I feel your pain in losing data. The external drives are fast for my Photoshop files, but video could be an issue. I haven”t heard of Retrospect, but I’m looking into it. Thanks for the input! I like your approach. You might consider encrypting your external drive with BitLocker or other software to protect yourself in case your drive is stolen or lost. Holds all files that I need regularly or work on at the moment (incl. raw files). Backup via Backblaze / Timemachine / Dropbox. NAS with RAID1) Holds my Timemachine backup and finished projects. Connected to amazon glacier / dropbox for automatic backup. External HD) Bootable mirror of PC-HD and mirror of NAS, updated 1-2 per month. Kept offsite. This way, everything is always available and automatically backuped and up to date. Be aware that disks, like camera and lenses, are not all created equal. There are ‘consumer’ level disks, and ‘professional’ level disks (the latter often with a SAS interface, not the more common SATA). ‘Pro’ disks are built with stricter specifications and better quality materials, exactly like a pro camera or lens, and designed to last longer under heavier workloads. Choose your disks wisely. If your computer allows for it, installing a RAID using two or more disks may be a better solution than a single external disk. It is usually faster, cable connections are more reliable, power is supplied by a better PSU (as long your PC has a good one), and cooling should be better as well. Then you can mirror it to an external system, preferably a RAID one as well, or any other good redundant technology. Then backup to ensure you can retrieve lost or damaged files. Unless you have a very fast internet connection, a local backup will ensure you can be back to work quickly. Assess your risks about using cloud backups. You need to be protected by burglary, fire, floods, earthquakes… but companies may go out of business, often with a short notice. Read the fine prints, and understand what kind of service you really pay for. Having one or more backups stored in a bank is still a good idea. I’ve been meaning to write an article about my backup and storage strategy. This is what I would have written. Matches my strategy. Nice article. Always love seeing people’s setup and thoughts around it. One thing I do have to comment on the article is your use of Seagate 3TB drives. I hope I’m wrong but better to point this out rather than finding out after multiple drive failures. If you’re using a Mac (or Linux) for the OS on your computer, there’s no need to pay for software to sync the two local drives, because they come with the tools you need built-in to the OS. If you’re not afraid of a little command-line usage, rsync is the perfect tool for keeping two directories synchronized, whether they’re on the same drive, two different drives, or even two machines that can connect to each other over a network. Add to that using the cron task scheduler built into those two operating systems, and you can have the command run as often as you’d like, down to every minute if you’re that paranoid about losing data. I believe there’s a way to make rsync run on Windows, but I haven’t ever tried it, so I know nothing about it. Without paying for any software, I have a Linux fileserver that stores and backs up all the data in my house from both mine & my wife’s machines to 2 locations, and then with my Crashplan subscription keeps everything backed up offsite. And since I have the local backup only running once per day, I have the backup drives set to read-only when I’m not writing data to them. I am a Mac user and would welcome learning more about how to make this happen. I have a Drobo 5D3 I want to mirror/sync to a Drobo 5D. Syncback is only available for PC. (Found that out the hard way after foolishly making the purchase). Any suggestions would be aprreciated. Thanks. I went with a Synology backup NAS, first set up price can be huge. I spent over $1400 to get the right backup system. Least now its maybe only replacing drives if they fail and the odd subscription plan for online storage. Check out the DroboApps section of their website for details on how to install apps directly.